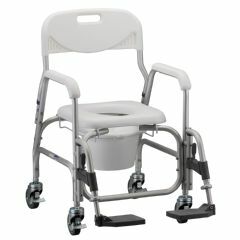 The Deluxe Shower Chair Commode has a bucket that can be removed without lifting the user or raising the seat. The removable swing away footrests, waterfall armrest & padded seat make the chair more comfortable. The chair has 4" swivel wheels with 4 locking casters (forks). It comes with a bucket, lid, & splash guard included. Seat height is 19" from floor. My mother is disabled and can not walk or stand. Medicare sent out a shower chair that would not work at all. So I bought this Nova chair. It is great! It lives up to the company's description...removable bucket without patient getting up, padded seat, swing-away footrests, very well made and sturdy, seat is large enough. Also, the back of the chair can be easily removed as needed and the support bar on the front does not jut out making it easy to get patient up next to seat. Worth every penney. Functional. Sturdy. Easy To Install. Safe. Great for short person. Lightweight. I had bought another chair that was too high for my mother; she is 5' 2" and we had to lift her up to get her on it. This chair she just sits down, it works. I would suggest you measure what height you need. Safe. Lightweight. Sturdy. Easy To Install. Functional. Well made. Easy to maneuver. Padded seat. Short in height. Seat is 16 1/2. Elderly. Disabled. Transfer fr bed to bathrm. Midrange Shopper. Budget Shopper. Caregiver. Safe. Lightweight. Sturdy. Easy To Install. Midrange Shopper. Caregiver. Budget Shopper. My husband has Alzheimer's and, while not elderly nor technically disabled, is physically challenged. The shower chair/commode provided by hospice was not satisfactory: it had a cloth backrest which promptly shredded and a small hard seat that was not large enough to be comfortable for my husband. It would be more appropriate for a smaller person. Additionally, the seat was a hard plastic; again, not comfortable. This chair has a sturdy plastic back and a padded seat that's the perfect size for my 170-pound, 6-foot tall husband. This chair is overall no larger than the hospice-provided chair, but is much more comfortable and satisfactory. It rolls easily with my husband seated on it with his feet on the footrests, is easy to get into our shower and has four locking wheels which occasionally come in handy. We are quite pleased with this chair. what is the height from the floor to the seat? Do the arms swing away or up, to allow for lateral transfer? Can foot rest be removed? I got the chair for my 130 lb. Mother who will not stand or walk anymore. I took the foot rests off immediately as she did not need them, she's so little! If I had'nt gotton this chair and changed out the bathtub, I think she would be in a nursing home.Do not want that! What is the clearance between the floor and the bottom of the bar located directly behind the foot rests? I am concerned about the clearance height for accessing our shower. Thanks!! The padded cushion seat on my shower chair/commode is worn out. How can I order a replacement seat? Hello Laura, If you have the Deluxe Shower Chair Commode we do carry the replacement padded seat for that particular shower chair commode. If you go to our site and type in Replacement Padded Seat for the Shower Chair / Commode, that will take you to re replacement padded seat. You can order online or call us to place the order.